Their garish orange robes are undoubtedly loud but the Buddhist monks of Cambodia roam the streets silently, gliding gracefully along the footpath toting umbrellas to shield their shaved heads from the sun. The monks are something of an enigma and during a whirlwind visit to Siem Reap, I join a travel buddy on a trip to Polangka Wat to catch up with a couple of friendly monks he met at Angkor Wat. As we push our way through the crowds, make our way past the shanties teetering precariously over Siem Reap River, dodging kittens, mopeds and unbelievably low-hanging powerlines, I wonder what I'll find at the temple. I've worn long pants and a long sleeve shirt out of respect but still, will I even be permitted inside this most sacred place? Polangka is not an ancient temple like the breathtaking buildings at Angkor, but a modern-ish cluster of donga-style rooms. A reasonably busy road seems to run through the middle of Polangka Wat but it's very quiet. Amid the hubbub we spy a lone monk with a warm grin. No, he doesn't know the monks we are seeking but would we like to come to his room? How could we say no? San Van's tiny room has a single bed and a shrine for meditation. His walls are adorned with religious paraphernalia and a noisy, dangerously wired fan clacks overhead. "Sit," he beckons, and we join him cross-legged on a rug covering the otherwise bare floor. He immediately begins chanting; it is intensely beautiful and deeply soothing. The 21-year-old monk performs an enchanting ceremony to give us a safe journey back to Australia, lighting incense and stirring strands of red wool in holy water before plaiting them into bracelets he blesses, and ties around our wrists. San Van is eager to practise his English and tells these rare visitors of his life as a monk. He explains how he grew up in a big family of rice farmers in a village called Bak Angrot, about 100km away. One of nine children, San Van says he has been interested in being a monk his whole life. "When I was a young boy, I saw a monk walking in my village with a bowl. I offered food to him," he recalls. "I left my family to live in the temple. 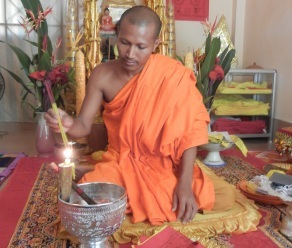 I became a novice young monk then I grew up and became a complete monk, (though) I still study." San Van says he occasionally speaks with his family on the phone but they do not have email in his village. He knows they are proud of his decision to devote his life to his faith. "My family is very happy." While we chat, an elderly local woman arrives with bags of dried noodles, a gift for the monk who is forbidden to have money or actively beg. She is blessed by the young man who appears to have made quite an impression on her. Once the villager leaves, San Van explains how he has been living in the temple for a year, and gives an insight in to the regimented lifestyle. He practises Theravada Buddhism, which has become popular in Australia. "We get up at 4 o'clock, go to the temple to pray and for meditation," he says. "Then after the sun rises the monks go outside to walk around the temple with a bowl. The people offer food to eat, all sorts of people. "In the morning we go to study Buddhism then in the middle of the day we eat. In the afternoon we go to the temple to pray again." When I ask him why he seems so relaxed on this day, he says with a smile: "No class today - it is Saturday." Even monks get a day off. San Van says they pray in the day from 6am until 10am and are in bed by 9pm. During the wet season, they are temple- bound for three months. He intends to remain a monk for the rest of his life, sacrificing marriage and children and other so-called rites of passage for religion and study. But he has loftier goals. He would like to visit other countries - Australia, even. "I want to continue to study at university," he says earnestly, before asking for our email address so we might stay in touch. I place a $US10 note in his donation bowl and get up to leave. "How much does university cost in Australia," he asks. Much more than in Cambodia, we explain. "Will you help me pay my university," he inquires. We politely decline and make our goodbyes. It is a memorable experience, and at least I learn that monks aren't unapproachable, nor are they shy. Amanda Keenan travelled to Cambodia courtesy of AirAsia.